James Downie married Helen Rebecca Gillis. James Downie was born in April 1844 at New York, Kings, New York, also reported as Wisconsin. He and Helen Rebecca Gillis were divorced before June 1900. James Downie died after June 1900. 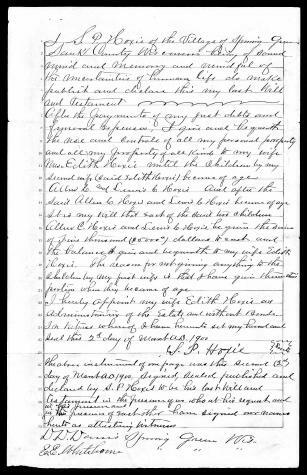 [S246] U.S. Federal Census 1880 U.S. Federal Census, by Ancestry.com, NA Film Number T9-1451 Page Number 288B. [S245] U.S. Federal Census 1900 U.S. Federal Census, by Ancestry.com, ED141. Dwelling 514. Married Name Her married name was Downie. Helen Rebecca Gillis married James Downie. Helen Rebecca Gillis was born on 17 October 1846 at Vernon, Waukesha, Wisconsin, also reported as Oct 1850. She and James Downie were divorced before June 1900. Helen Rebecca Gillis died after June 1900. Helen Rebecca Gillis had 3 with 3 living in 1900 children. [S245] U.S. Federal Census 1900 U.S. Federal Census, by Ancestry.com, ED141. Dwelling 13. Irene Caroline Downie was born on 30 April 1892 at Waukesha, Waukesha, Wisconsin. She was the daughter of Sargent Roger Hawkins Downie and Amalia Emily Diehl. Earl Sargeant Downie was born on 11 March 1894 at Waukesha, Waukesha, Wisconsin. He was the son of Sargent Roger Hawkins Downie and Amalia Emily Diehl. Earl Sargeant Downie died before June 1900. Hazel Leona Downie was born on 14 November 1896 at Waukesha, Waukesha, Wisconsin. Helen May Downie was born on 2 October 1898 at Waukesha, Waukesha, Wisconsin. (?) Chatman married Elmina L. Cass, daughter of James Milton Cass and Mary Taplin, before 1855. Name Variation Frank A. Chatman was also known as Hoxie. Frank A. Chatman was born circa 1855 at Wisconsin. He was the son of (?) Chatman and Elmina L. Cass. Frank A. Chatman died on 10 April 1882. He was buried after 10 April 1882 at Spring Green Cemetery, Spring Green, Sauk, Wisconsin, 27y. [S247] U.S. Federal Census 1870 U.S. Federal Census, by Ancestry.com, Page 7. Dwelling 45. 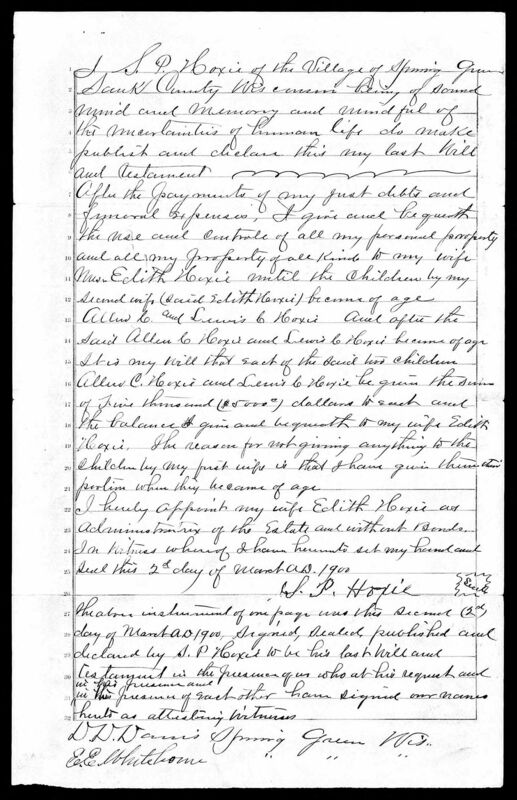 [S246] U.S. Federal Census 1880 U.S. Federal Census, by Ancestry.com, NA Film Number T9-1446 Page Number 237A. Name Variation Silas Paddack Hoxie was also known as Silas Paddock. Name Variation Silas Paddack Hoxie was also known as S. P.
Silas Paddack Hoxie was born on 28 April 1832 at Maine. Silas Paddack Hoxie married Elmina L. Cass, daughter of James Milton Cass and Mary Taplin, circa 1859 at her second marriage. Silas Paddack Hoxie married Edith Cole Walker on 28 May 1891 at 2nd marriage for him. He was buried after 10 March 1900 at Spring Green Cemetery, Spring Green, Sauk, Wisconsin, 67y 10m 10d. In 1880 S. P. HOXIE, farmer, Sec. 8; P. O. Spring Green; was born in Piscataquis Co., Maine, April 30, 1832; in 1847, he came to Wisconsin and located in Cooksville, Rock County, where he remained until 1865, then removed to his present home in Spring Green, Sauk Co., Wis. 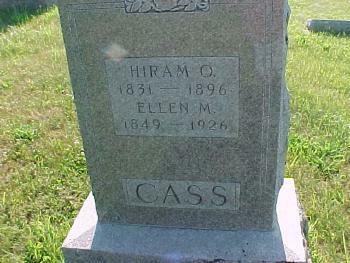 He married in Richland Co., Wis., Miss Elmina Cass; they had four children - Frank A., James A., Lillian B. And Freddie. Mr. Hoxie owns a finely located and well improved farm of 110 acres, in the vicinity of the village of Spring Green; he has been a continual resident of Wisconsin since 1847, with the exception of three years he spent on the Pacific Coast. In politics, he is a Republican; he is a prominent member of the Grange, and has filled various offices in that society.6 Silas Paddack Hoxie left a will on 2 March 1900 at Sauk, Wisconsin. [S248] U.S. Federal Census 1860 U.S. Federal Census, by Ancestry.com, Page 62. Dwelling 565. James Herbert Hoxie was born in November 1859 at Wisconsin. He was the son of Silas Paddack Hoxie and Elmina L. Cass. James Herbert Hoxie married Susan Frances Campbell, daughter of Isaac Campbell and Mary Gernert, circa 1885. 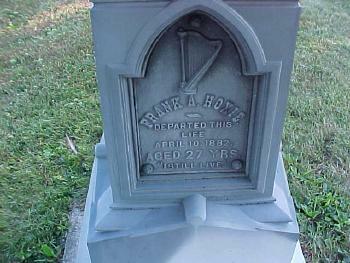 James Herbert Hoxie died in 1931. Simon Cass married Elizabeth Locke. Simon Cass was born in 1750 at Epson, Rockingham, New Hampshire. Married Name Her married name was Cass. Elizabeth Locke married Simon Cass. Theophilus Cass was born on 26 December 1777 at Epson, Rockingham, New Hampshire. He was the son of Simon Cass and Elizabeth Locke. Theophilus Cass died on 27 December 1861 at Stanstead, Quebec, Canada, at age 84. Name Variation Lillian Belle Hoxie was also known as Lillian Bell. Name Variation Lillian Belle Hoxie was also known as Lillian V.
Married Name circa 1887 As of circa 1887,her married name was Holmes. Lillian Belle Hoxie was born in January 1864 at Wisconsin also reported as 1863. She was the daughter of Silas Paddack Hoxie and Elmina L. Cass. Lillian Belle Hoxie married George B. Holmes, son of (?) Holmes and Louisa (? ), circa 1887. Lillian Belle Hoxie died in 1938. Lillian Belle Hoxie witnessed the adoption of Glenn Churchill Holmes after June 1900. Lillian Belle Hoxie had one adopted son children. Name Variation Fred W. Hoxie was also known as Freddie. Fred W. Hoxie was born in June 1874 at Wisconsin. Fred W. Hoxie died in 1928 at New York. Name Variation Mary Ellen Simpson was also known as Ellen Mary. Married Name July 1869 As of July 1869,her married name was Cass. Mary Ellen Simpson was born in 1849 at Indiana also reported as Illinois. She married Hiram Osman Cass, son of James Milton Cass and Mary Taplin, in July 1869. Mary Ellen Simpson was buried in 1926 at Willow Valley Cemetery, Ithaca, Richland, Wisconsin. Mary Ellen Simpson had 3 with 3 living in 1900 children. [S247] U.S. Federal Census 1870 U.S. Federal Census, by Ancestry.com, Page 31. Stamp 691. Dwelling 239. [S246] U.S. Federal Census 1880 U.S. Federal Census, by Ancestry.com, NA Film Number T9-1445 Page Number 209C. [S245] U.S. Federal Census 1900 U.S. Federal Census, by Ancestry.com, ED124. Dwelling 222. [S244] U.S. Federal Census 1910 U.S. Federal Census, by Ancestry.com, ED97. Dwelling 50. [S243] U.S. Federal Census 1920 U.S. Federal Census, by Ancestry.com, ED205. Dwelling 186. Married Name before 1855 As of before 1855,her married name was Cass. Chloe Manley was born at Connecticut. She married Hiram Osman Cass, son of James Milton Cass and Mary Taplin, before 1855. Chloe Manley died in January 1860. Name Variation Junius Cass was also known as Julius. Junius Cass was born on 14 May 1855 at Richland, Wisconsin. He was the son of Hiram Osman Cass and Chloe Manley. Married Name before 1898 As of before 1898,her married name was Powers. Hattie Cass was born on 28 December 1862 at Wisconsin. She was the daughter of Hiram Osman Cass and Harriet E. Hungerford. 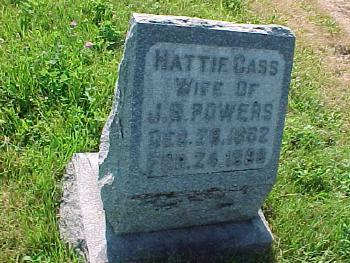 Hattie Cass married J. S. Powers before 1898. Hattie Cass died on 24 February 1898 at age 35. 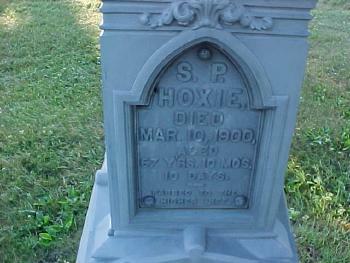 She was buried after 24 February 1898 at Willow Valley Cemetery, Ithaca, Richland, Wisconsin. Otis Cass was born circa 1871 at Wisconsin. He was the son of Hiram Osman Cass and Mary Ellen Simpson. Married Name Her married name was Mendhall. Name Variation Belle A. Cass was also known as A. Belle. Belle A. Cass was born in June 1874 at Wisconsin. She was the daughter of Hiram Osman Cass and Mary Ellen Simpson. Belle A. Cass died in 1961. 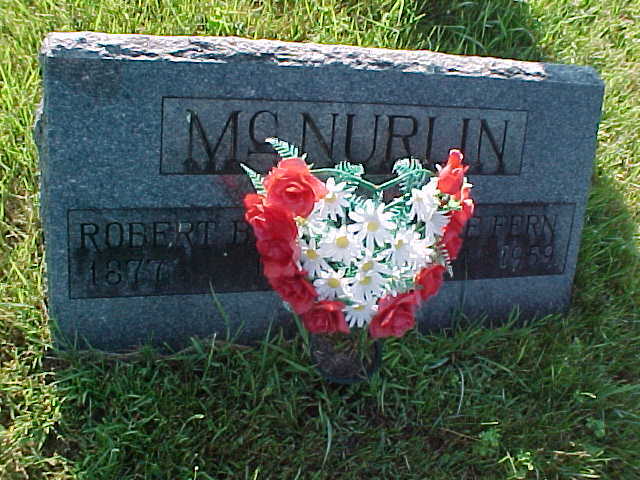 Married Name Her married name was McNurlin. Name Variation Fannie Fern Cass was also known as Fanny. Fannie Fern Cass married Robert Bruce McNurlin, son of Thomas Jefferson McNurlin and Margaret Ann Fulton. Fannie Fern Cass was born on 27 December 1877 at Wisconsin. Fannie Fern Cass died on 20 July 1959 at age 81. She was buried after 20 July 1959 at Willow Valley Cemetery, Ithaca, Richland, Wisconsin. Ebenezer Evans was born circa 1837 at Wales. Ebenezer Evans died before 1882. Ebenezer Evans immigrated with Evan D. Evans and Jane Morgan Newgate in 1852. Daniel Evans was born circa 1841 at Wales. Daniel Evans died before 1882. Daniel Evans immigrated with Evan D. Evans and Jane Morgan Newgate in 1852. David Evans was born circa 1844 at Wales. David Evans immigrated with Evan D. Evans and Jane Morgan Newgate in 1852. Name Variation Elizabeth Evans was also known as Betty. Name Variation Elizabeth Evans was also known as Bettie. Married Name December 1880 As of December 1880,her married name was Powell. Elizabeth Evans was born on 16 February 1850 at Wales also reported as Feb 1853. She was the daughter of Evan D. Evans and Jane Morgan Newgate. Elizabeth Evans married William Vavasor Powell, son of David M. Powell and Elizabeth Wickham, in December 1880 at Wisconsin. Elizabeth Evans died on 28 October 1906 at Iowa, Wisconsin, at age 56. Elizabeth Evans immigrated with Evan D. Evans and Jane Morgan Newgate in 1852. Elizabeth Evans had 4 with 4 living in 1900 children. Married Name before August 1860 As of before August 1860,her married name was Evans. Mary (?) was born circa 1835 at Wales, England. She married Daniel D. Evans, son of (?) Evans, before August 1860. [S247] U.S. Federal Census 1870 U.S. Federal Census, by Ancestry.com, Page 7-8. Dwelling 52. Thomas Evans was born circa 1862 at Wisconsin. He was the son of Daniel D. Evans and Mary (?). Elizabeth Evans was born circa 1864 at Wisconsin. She was the daughter of Daniel D. Evans and Mary (?). John H. Evans was born circa 1867 at Wisconsin.